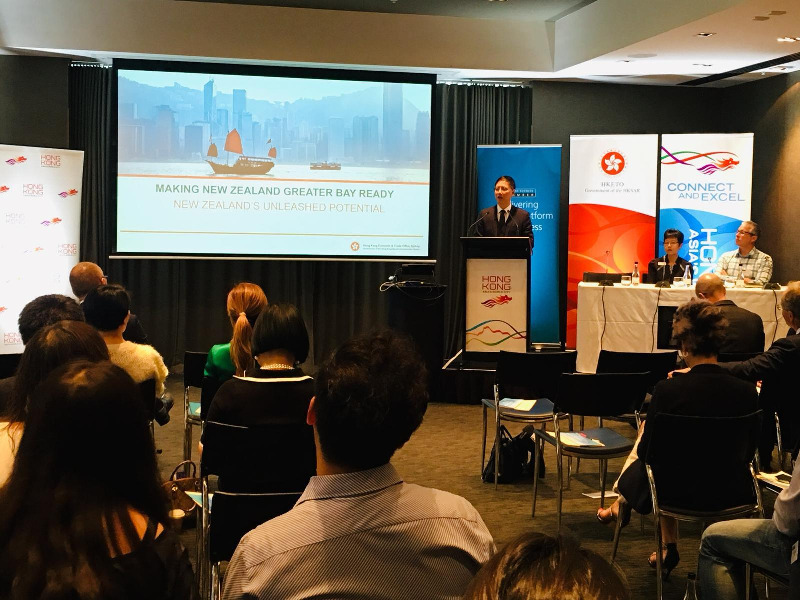 The Hong Kong Economic and Trade Office, Sydney (HKETO Sydney), together with the Auckland Business Chamber, held a business seminar in Auckland, New Zealand, on March 21 (Auckland time) on the unparalleled opportunities offered by Hong Kong and the Guangdong-Hong Kong-Macao Greater Bay Area for New Zealand businesses. Entitled "Accessing the world's largest market through Hong Kong", the seminar presented to New Zealand business leaders the important role Hong Kong plays in the Greater Bay Area's development and how Hong Kong can provide benefits for New Zealand across many areas given that it is the most open international city in the Greater Bay Area, a well-connected transport hub, and an innovation and technology centre. The Greater Bay Area, comprising the two Special Administrative Regions of Hong Kong and Macao and nine Guangdong cities with an estimated GDP of US$1.5 trillion and a population of some 70 million, is the safest and most strategic entry point into the massive North Asia market, and an economy actively promoting unimpeded trade and investment with New Zealand. The seminar comprised three sessions - "Making New Zealand Greater Bay Ready: New Zealand's Unleashed Potential", "Building for Tomorrow, Today: Thinking Infrastructure, Think Hong Kong" and "A World Connected: Hong Kong as an International and Technology Hub" - and panel discussions. 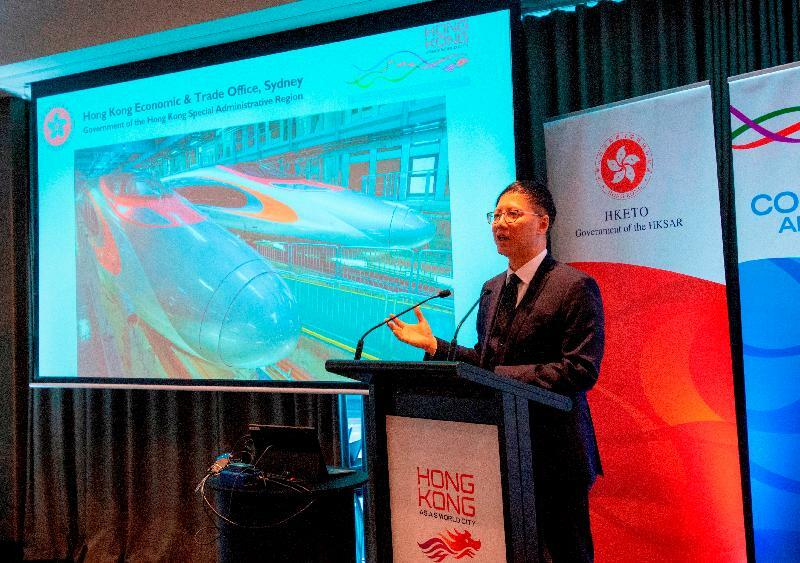 The Director of HKETO Sydney, Mr Raymond Fan, spoke on Hong Kong's strong ties with New Zealand and the latest developments of the Greater Bay Area. He said the Outline Development Plan for the Guangdong-Hong Kong-Macao Greater Bay Area promulgated by the Central Government clearly supported Hong Kong in consolidating and enhancing Hong Kong's status as an international financial, transportation and trade centre as well as an international aviation hub; strengthening Hong Kong's status as a global offshore Renminbi business hub and its role as an international asset management centre and a risk management centre; promoting the development of high-end and high value-added financial, commercial and trading, logistics and professional services; making great efforts to develop the innovation and technology industries; nurturing emerging industries; and establishing Hong Kong as the centre for international legal and dispute resolution services in the Asia-Pacific region. "These areas of work are all conducive to developing Hong Kong further as an international metropolis with enhanced competitiveness. Meanwhile, we are also glad to learn about the eight policy measures introduced by the Central Government which could assist Hong Kong residents to develop, work and reside in the Mainland cities of the Greater Bay Area, as well as strengthen the convenient flow of people and goods within the Greater Bay Area," he said. The Director, Australia and New Zealand, of the Hong Kong Trade Development Council (HKTDC), Ms Bonnie Shek, highlighted Hong Kong's role in connecting New Zealand companies with the Greater Bay Area, pointing out that New Zealand companies could commercialise products or service systems through professionals or intellectual property trading in Hong Kong. The Head of Transport and Industrial of Invest Hong Kong (InvestHK), Mr Benjamin Wong, said Hong Kong's unique advantages under "one country, two systems", together with the city's geographical location, robust legal system and low and simple tax system, could bring unequalled benefits to New Zealand business. In addition, HKETO Sydney also co-hosted a reception in Auckland on March 21 with the HKTDC, InvestHK and the Hong Kong-New Zealand Business Association, under the theme of "Connect and Excel". Speaking at the reception, Mr Fan said Hong Kong in 2018 continued to build on its reputation as the gateway to Asia, growing its connections with the Mainland of China and the region. Hong Kong continues to be one of the best-connected cities in the world, with world-class transport and infrastructure making it a business, transport and trade hub. "The Greater Bay Area will surely bring Hong Kong significant opportunities to diversify its economy and develop innovation and technology, which is an economic driver in the new era," Mr Fan said. "As we enter another busy year in 2019, I look forward to the fostering of a stronger relationship between Hong Kong and New Zealand. Hong Kong stands ready to connect you to your next opportunity and to help you to not only succeed in your endeavours, but to excel in them," Mr Fan added.